We had a great weekend in E WA with my Aunt and Uncle! We have been wanting to see Train for years, and we finally had the opportunity this last weekend. They were playing the Maryhill Winery Amphitheater Saturday night. I love the winery for concerts. Max capacity is 4,000 (compared to the the 7,000 to 10,000 I’m used to for Aerosmith concerts), so the bathroom lines and concession lines were not that bad. Plus we had really great reserved seats…there is a photo below showing how close we were. It is not a great photo because we wrongly thought cameras were not allowed, so that is a shot from my cell phone. 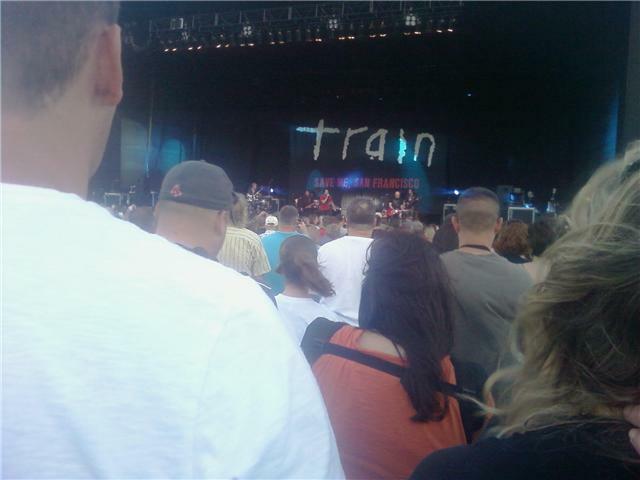 Train is pretty mellow, therefor the crowd was pretty mellow as well which is a really nice change. Pat Monahan is one of the best front men ever! He is funny, totally gets into the music and dances like none of us are watching him, sounds just as good live as he does on CD, and he is cute! It was refreshing to go to a concert without the big screen and all the lights. They were just a band on a stage playing their hearts out and every song was amazing! We will totally go see them again and I would go to concerts at the winery in a heart beat! The best outdoor venue I have ever been to! Pat Monahan, lead singer, is int he red shirt under the train sign in the background, he is between the t and the r. Not sure this pic does a great job of showing how close we really were because we could see his facial expressions no problem.